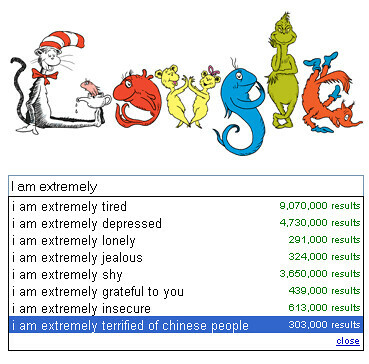 Is it Google or is it Dr. Seuss who is extremely terrified of Chinese people? I captured this screenshot during Theodor Seuss Geisel's birthday on Monday in the midst of a flu fever. Try typing "I am extremely " into a Google search page if you haven't already. And let me be reason number 303,333 to be extremely terrified. BWAHAHAHAHA!